Poor people “over the age of 60 who are living with one of 9 life-limiting conditions” are being subjected to an ongoing experiment in care transitions in the Akron, Ohio, region. Medicaring.org gave the project a very favorable review just a few months ago. The study is called the “PEACE Trial (Promoting Effective Advanced Care for Elders), a project involving Summa Health, the Area Agency on Aging (AAA), University of Akron, Kent State University, and the Northeastern Ohio Universities of College of Medicine and Pharmacy. The randomized controlled pilot study features a geri-palliative care case management intervention for Ohio consumers who are participants in the state’s long-term care Medicaid waiver program, PASSPORT. Frequently, these elders have not documented their advance care preferences, and so arrive in the hospital, where family members are left to make critical decisions for which they are unprepared. The PEACE Trial [focuses] on health coaching and patient activation for self management, while promoting advance care planning discussions with primary care providers.
. . . Care managers make two home visits, for example, centered on symptom assessment and advance care planning. They review findings with an interdisciplinary team, which makes appropriate recommendations for the patient and the primary care provider. The care manager next accompanies the consumer to one visit with the primary care provider to discuss advance care goals. Following this, the care manager and the palliative care nurse supervisor make an additional home visit to begin to implement the care plan. Let’s be clear: the PEACE Trial is not about physician-assisted suicide. It is not about barbiturate overdosing or gas inhaling in the manner of Timothy Quill or Jack Kevorkian. The PEACE Trial is all about coaching people on making end-of-life decisions. Co-investigator for the PEACE Trial is Steven “Skip” Radwany. MD. Dr. Radwany is a professor of medicine at Northeastern Ohio Universities Colleges of Medicine and Pharmacy, and medical director for Summa Health System’s Palliative Care and Hospice Services. Dr. Radwany gained credentials with the death with dignity crowd in 2003 when he called for the withdrawal of nutrition and hydration from Gerald Carpenter, an elderly man who had suffered a stroke in a nursing home. Carpenter could open his eyes and move his arms and legs, but he could not eat. A nurse at the nursing home said that Carpenter had said he would want life-sustaining treatment. Carpenter’s son hadn’t visited the father in so many months that it was difficult for the nursing home to locate him. When he was finally contacted, he wanted his father’s feeding tube removed. Dr. Radwany agreed. Bottom line: It’s all about the coaching. The so-called Physician Orders for Life-Sustaining Treatment (POLST) Paradigm is in the news because the Catholic bishops of Wisconsin have issued a warning against the use of POLST. POLST and other advance directives play an important role in the Community-Based Care Transitions Program (CCTP) and Partnership for Patients discussed in a previous post here at Belbury Review. 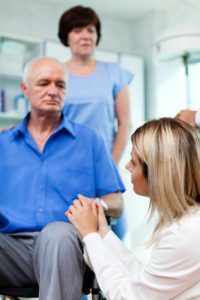 In order to reduce hospitalizations within a community, participants in the care transitions demonstration projects generally use one of a handful of “intervention” programs. 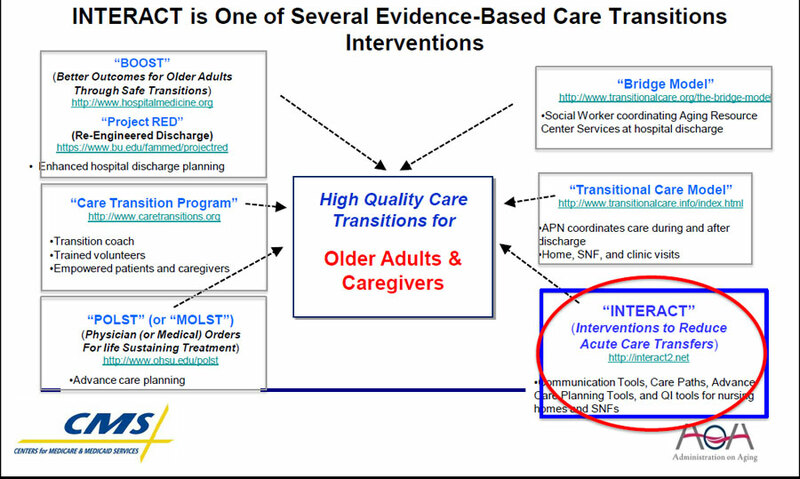 A few of those interventions appear on a useful diagram that is posted at the Administration on Aging website (see illustration at right). Though the slide was part of a presentation on “Interact” — just one of the interventions — it presents a good summary of some of the others. POLST is one of those interventions. 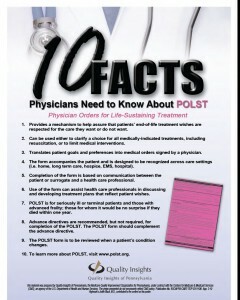 CFMC — the National Care Transitions QIO Support Center — is promoting POLST. One of the tools they offer on their website is a flyer for POLST that was created by the QIO for Pennsylvania, Quality Insights of Pennsylvania. Quality Insights is actually a program out of the West Virginia Medical Institute. West Virginia was one of the first states to actively promote POLST, so it is not surprising that Quality Insights is promoting POLST. 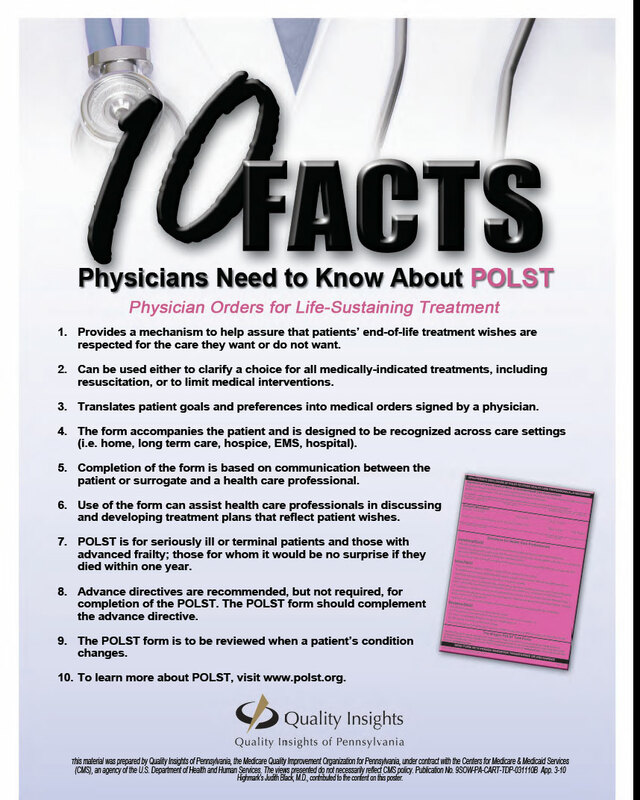 A poster advertising POLST was created by the QIO of Pennsylvania and is offered by CFMC as a sample tool for care transitions projects across the country. 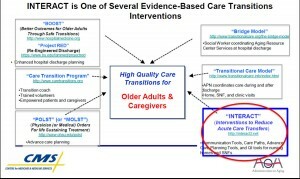 While some of the care transitions interventions focus on pressuring patients and families to be responsible for proper medication, symptom identification, doctors’ appointments and so forth, a number of the interventions focus on end-of-life decisions, DNRs, and advance care planning. This is particularly true of interventions involving patients in nursing homes who are frail and might request another trip to the emergency room. The Interact tool also discusses “Artificial Hydration/Nutrition” and the supposed dangers of feeding tubes. These are but a few examples of POLST and end-of-life discussions prompted by the “care transitions” project. Transitions is a broad term that can refer to moving from one care setting to the next, changing goals of care, changing both care setting and goals (as happens with the transition to hospice care), or even death. 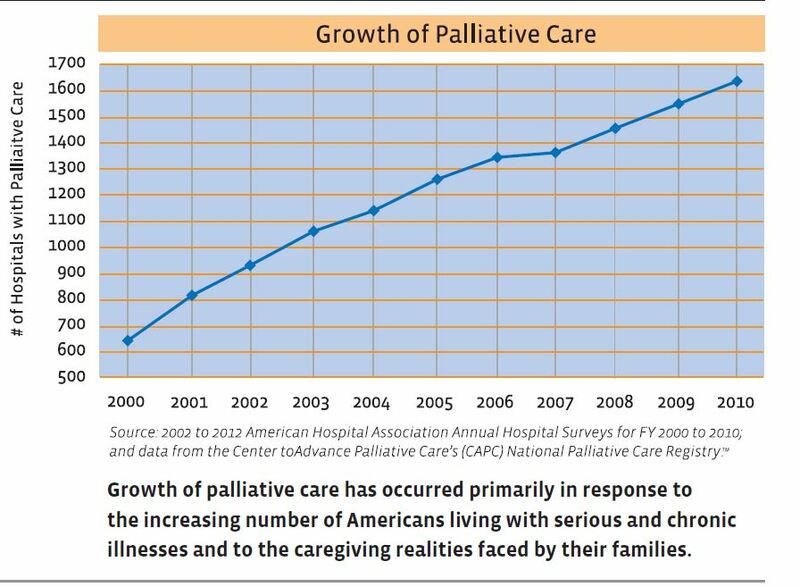 Strong palliative care teams, statewide outreach and education, and programs like POLST allow hospitals and healthcare systems to support patients, families, and clinicians in the inner work of letting go. Not all of the care transitions interventions focus on “letting go,” but coaching patients and families in end-of-life decisions is a key feature in many contexts.